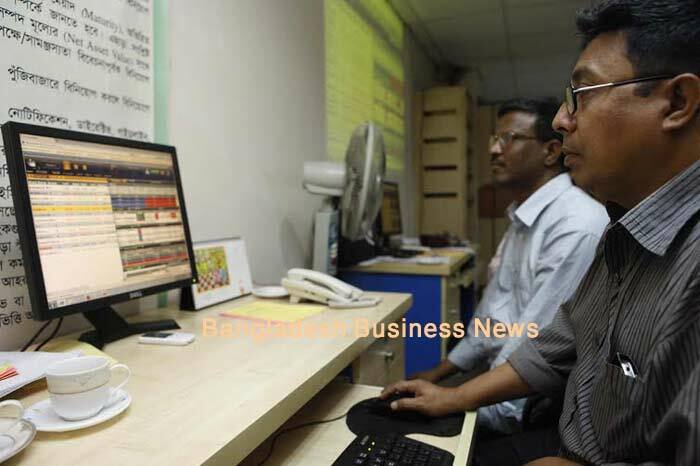 Dhaka, Bangladesh (BBN)-Bangladesh’s stocks continued its upward trend after witnessing early hour on Thursday, the last trading session of the week. The key index of Dhaka Stock Exchange (DSE) advanced 33.81 points while the port city bourse, selective category index of Chittagong Stock Exchange (CSE) earned 50.17 points around 12:30pm. DSEX, the prime index of the Dhaka Stock Exchange (DSE), went up by 33.81 points or 0.77 per cent to stand at 4, 413.04 points, when the report was filed at 12:30pm. The DS30 index, comprising blue chips, advanced 18.84 points or 1.14 per cent to reach at 1,669.72 points. The DSE Shariah Index (DSES) also gained 5.20 points or 0.49 per cent to reach at 1,063.92 points. DSE turnover stands at only BDT 2.46 billion when the report was filed at 12:30pm. Of the issues traded till then, 177 advanced, 84 declined and 37 issues remained unchanged. The port city bourse – the Chittagong Stock Exchange (CSE) also saw upward trend till then with its Selective Category Index- CSCX– advancing 50.17 points to stand at 8, 233.28 points, also at 12:23pm. Of the issues traded till then, 112 gained, 61 declined 35 issues remained unchanged with a turnover value of BDT 260 million.